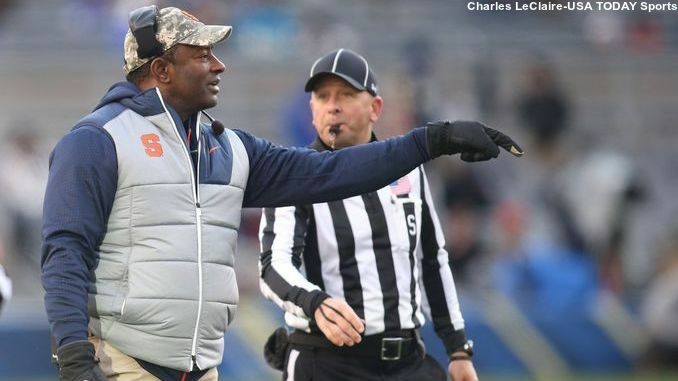 Dino Babers coaches during the first half of Syracuse's game. Mandatory photo credit: Charles LeClaire-USA TODAY Sports. Syracuse football announced on Wednesday that it added three members to its 2018 class, with running back Akeem Dixon, running back Jarveon Howard and defensive lineman Caleb Okechukwu signing National Letters of Intent. Syracuse’s class is now ranked 43rd in the country with an average score of 85.58, and 50th according to total score, according to 247 Sports. Akeem Dixon had committed to the Orange back in May, but wasn’t among those in the early signing period because of academic concerns. Those concerns were addressed with a strong fall semester, allowing Dixon to qualify to play for SU, writes Syracuse.com’s Stephen Bailey. Check out video of Dixon signing courtesy of TCPalm.com’s Jon Santucci. It wasn’t all good news for the Orange, though. Four-star running back Mychale Salahuddin was deciding between Syracuse and Pitt, and initially put on an Orange hat before tossing it aside to reveal a Panthers t-shirt. The Washington Post’s Samantha Pell posted video of Salahuddin’s last second flip-flop. He previously was committed to USC and had also considered North Carolina. 2018 defensive lineman Fitzroy Gardner will not be joining the Orange, for now at least, reports The Tampa Bay Times’ Bob Putnam. The Florida product will instead attend Iowa Western Community College, and if he qualifies, the Orange will hold a scholarship spot open. He could conceivably qualify in time to join the team for the fall season. Syracuse is also officially out of the running for one-time commit Tyrone Sampson. The four-star offensive lineman officially scratched Syracuse off the list, and is now considering offers from Arizona State, Nebraska, Mississippi State and Western Michigan according to MLive’s Jared Purcell. That’s all from the recruiting world for today. Have a great Thursday!